Since 2008, the rate of pedestrian deaths in Georgia has steadily increased. In 2014, 163 pedestrians in Georgia lost their lives. In 2016, the death toll increased to 232. As of December 21st, 2017, a total of 253 people in Georgia died in pedestrian-related traffic accidents. So what are the reasons why there have been so many pedestrian accidents in Georgia, and why has the state failed to make safety progress? We will discuss some of the factors below. Drivers breaking roadway rules is a major cause of fatal pedestrian collisions. Many motorists do not understand or respect pedestrian’s rights. They often drive too closely to pedestrians and ignore pedestrian right-of-way at crosswalks and intersections, endangering pedestrians’ lives. Others Georgia drivers ride recklessly, engaging in dangerous habits such as speeding through school zones, running red lights, talking on their cellphone or eating while driving, or driving while under the influence of drugs or alcohol. All of these factors have led to an annual increase of pedestrian accidents. In Georgia, state pedestrian laws hold that drivers must “stop and remain stopped” for pedestrians, rather than only yielding to them. Drivers must stop and wait for pedestrians to cross the half of the road where they are driving, when a pedestrian is in a crosswalk. It is illegal for drivers to cut crossing pedestrians off or squeeze past pedestrians on the same half of the roadway. The stop and stay rule only applies, however, when a pedestrian is inside a crosswalk. In any other situation the rules of the road are reversed, with the duty of caution lying in the hands of the person on foot. A pedestrian crossing the road outside a crosswalk must yield the right-of-way to all vehicles on the roadway. The only exception is if the pedestrian has already safely entered the roadway when the vehicle appears. Pedestrians may not cross the road anyplace other than a marked crosswalk while on a road with adjacent intersections with traffic-control signals. Pedestrians should use sidewalks or pedestrian walkways wherever available or walk as close to the left-hand side of the road as possible (facing oncoming traffic). Other Primary Reasons for Pedestrian Accidents? So what are the other factors that lead to pedestrian accidents each year in Georgia? 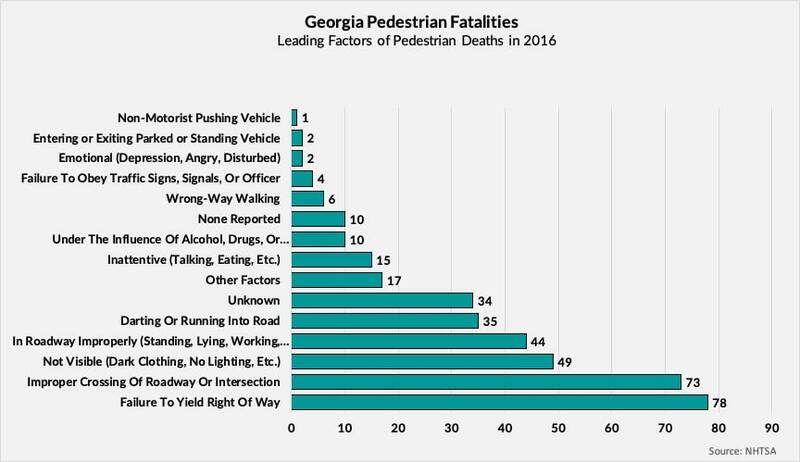 To assist with this problem, the Atlanta pedestrian accident lawyer team at Butler Wooten & Peak, LLP put together a chart of the top factors of pedestrian-related fatalities in the state of Georgia in 2016. You can see this cart below. Census data from 2010 reported that Georgia’s population was at 9,687,653 people. Since then, the state has shown a drastic increase. The population estimates for July 1, 2018 was at 10,519,475. This is a estimated increase of 8.6% in an eight year span. And the rate of Georgians will only increase in the future. In Atlanta alone, it was reported by the Atlanta Regional Commission that in 2018 the total population increased by 1.7% totaling 4,555,900 people. With the increase of population in the state will come an increase in traffic on the roadways, congestion on the roads and highways, as well as a growth in the frequency of pedestrian accidents. What is Georgia Currently Doing About the Pedestrian Accident Problem? Drivers are engaging in distracted driving more often than in previous years, due to extensive cell phone use. In 2016, distracted drivers killed at least 3,450 people in the United States. Around 481,000 drivers use handheld cell phones while driving every day. The increase in distracted and negligent driving could be contributing to Georgia’s rising pedestrian death toll. The issue could also lie in roadway infrastructure. It is the city’s responsibility to increase the safety of the roadways, sidewalks, and crosswalks for pedestrians. While the city does not have to guarantee safety, it must reasonably prevent accidents and injuries as much as possible. This includes inspecting roads for hazards and making repairs. It also includes designing roads and intersections in a way that is safe for all road users. If a defective or dangerous roadway, crosswalk, or traffic signal causes a pedestrian accident, the government could be liable for damages. Lack of safe pedestrian corridors, tunnels, and other solutions in Georgia may contribute to the high number of pedestrian deaths year after year. Victims of pedestrian accidents may have cases against the state or local government for the negligent failure to install safe pedestrian pathways or to design a safe roadway. Pedestrians may also have cases against property owners, drivers, construction zone managers, and/or several other parties for damages, depending on the situation. Personal injury claims may not be able to fix the issues causing an increase in pedestrian deaths in Georgia, but they can help victims look forward to brighter futures.